Another fortnight and another set of words for The Craft Barn's Quotes and Lyrics Challenge - this time HUG and/or NOWHERE. There are many good quotes for both words but no image popped into my head and then I thought of Nowhere Man by The Beatles. Having visited Wikipedia I see Nowhere Man was written 49years ago this week and was The Beatles first song not about love, but written by John Lennon with a more philosophical bent. 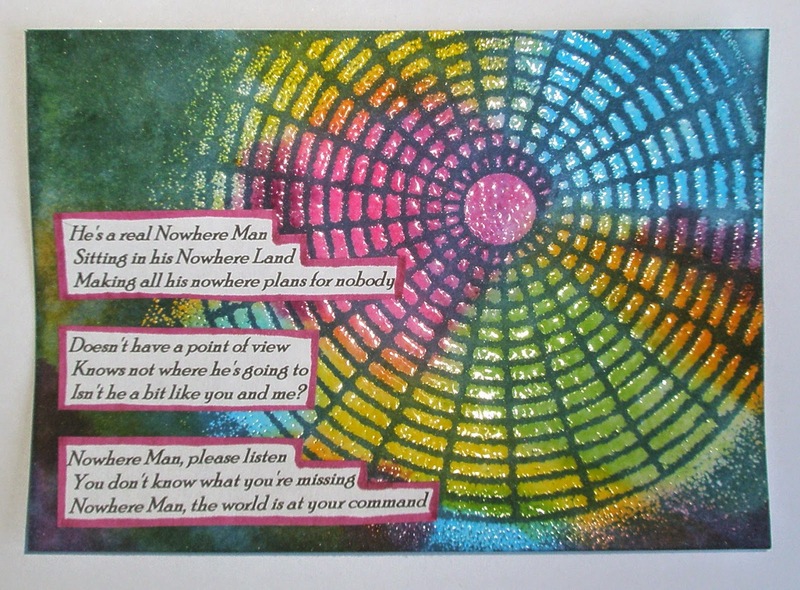 Tricky to depict a Nowhere Man so I went for a 1960s kaleidoscope of colour - a never ending wheel to nowhere etc etc. The background is a mix of all the bright Distress Inks I own, blended and spritzed with water etc. I've then used my Studio Calico Circle Graph Stencil - inked through with Versamark, clear embossed and then inked over with Faded Jeans Distress. I love it - not sure it has anything to do with The Beatles and the swinging 60s but I think it's bright and cheerful!! Thanks for visiting and for all your comments on my last entry - very much appreciated!! PS. Having linked this up I saw Helen's page using the same lyrics and thought mine was definitely missing a man. I rummaged and found my man stamp (freebie from Craft Stamper) so I've added my Nowhere man too! I saw that kaleidoscope and was immediately impressed with all the colors. From what I've read about the 60s, these are the perfect colors. And your little man really topped it off nicely. Great song lyrics and interesting back story about the Beatles. I love learning new things and this was a treat. Fantastically represenation of the 60s, I wasn't around then but this sure makes me think of the 60s. Love the colourful background circle. This is so very 60s! I love the Beatles and I love your entry this week! Such a wonderful page, love the colors. Excellent. Love the stencil and colour of the background. I used the same lyric but your interpretation is very different to mine. I love what you have done.